February 14, 2017 This post may contain affiliate links. Our family eats sugar. There I said it. I’ve come clean. It’s out there. And I feel so much better for it. I let my kids eat sugar for the same reason I let them climb trees and use knives in the kitchen. At some point we need to teach our children how to be careful. They all have to learn to hold on to the branch (or they will fall) and not hold the sharp end of the knife (or they will cut themselves). Sugar isn’t the bad guy. It’s just sugar. Like the tree is just a tree. And the knife is just a knife. But. Big ‘But’ here (because this is what’s missing in many people’s lives), we also need to teach our kids the danger of eating too much sugar and also how much is too much. I add a teaspoon of sugar to my coffee every morning. I’ve tried it without, and it just tastes crappy. My eldest daughter likes to sprinkle raw sugar on her oat porridge some mornings. She likes the way it melts on top and the flavour only brown sugar can provide. My youngest son (and also the healthiest of the bunch) loves big, hot pancakes with raw sugar, tons of cinnamon and a good squeeze of fresh lemon. He has his pancake preparation down to a finely tuned art. It takes him twice as long to get them ready than it does to eat them. He really does make them look good. We all have that little treat that we love. Will the sky crash down? Will these little indulgences drastically affect our health? I doubt it. And as my eldest Son likes to say, I’m willin’ to “Risk it for the biscuit”. It’s a phrase that he came up with after seeing the Mynah birds eating scraps off the road as you drive towards them. They always wait until that last second to fly away. You see, these small indulgences are just that. Small pleasures that we enjoy and have no intention of giving up despite the latest diet trend. It is so easy to be sucked in by the promises of the ‘next big thing’. Diets don’t work. We all know that. Well, they work for a bit and then you go back to real life and the stats are not in your favour. Chances are that you will return to your old eating habits. I read that it was a 90% chance, but I couldn’t find the science to back me up. All the deprivation and struggle of the last diet wasted. And then you feel like you’ve let yourself down. That used to be me. Starting on any one Monday morning I would restrict and carefully control the food I would eat. I would promise to give up all the ‘bad food’ for two whole weeks. That’s about as long as I could keep it together before I would give up. I would ban all sugar from the house. Kids would be miserable. I would be miserable and hungry. Actually, in all honesty, Clean Eating started as another one of these little ‘diets’. Except that it never ended. Two weeks went by. Then a month. Fast forward two years. We are still eating real food. And yes, this includes Sugar. To explain is all very simply – because its the boring schooly bit. Our body works by breaking the carbohydrates we eat into sugar and this is used as energy to fuel our cells. Most of us eat enough carbohydrates in the form of fruit, veggies and grains etc to fulfil this function without needing to add any more sugar at all to our diet. This is where the ‘Quit Sugar’ advocates come in. And they are right. We get enough naturally. We really don’t need anymore of the stuff to function. 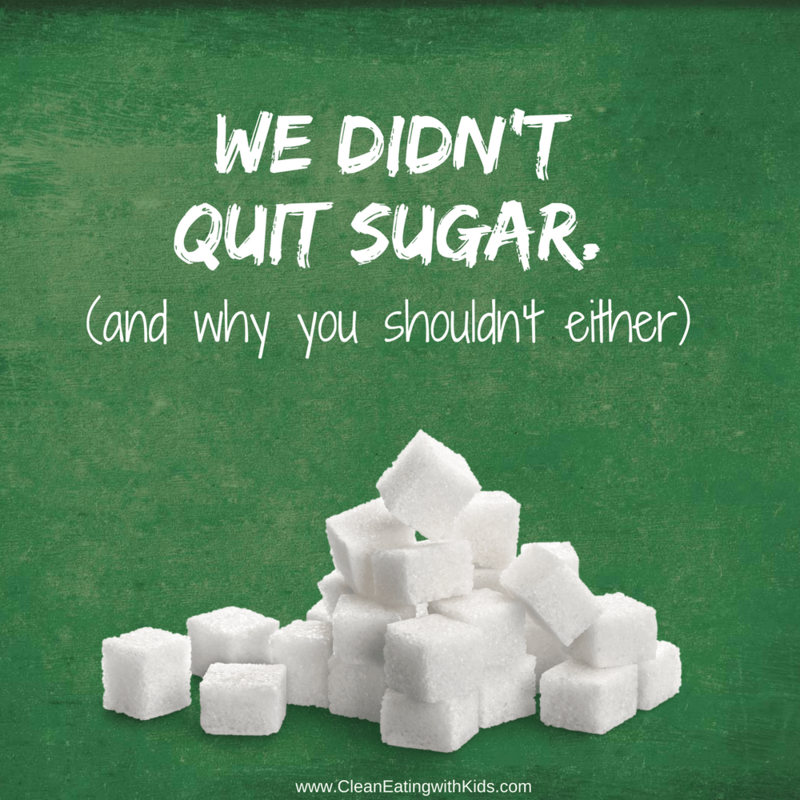 So, now you are wondering – Why does my family eat sugar? I believe that one of the reasons Clean Eating works for us is that we don’t cut out sugar. Deprivation diets do not work. You need to design a lifestyle that you and your family can actually live with. As in every day. According to the World Health Organisation, an adults recommended free sugar intake should be around 6 teaspoons a day (or 10% of their daily calories). So this is not counting sugar from fruit, vegetables and dairy. 1. all sugars added to foods, whether that is by the manufacturer (think soft drinks, processed biscuits, bars, chocolate, jams and sauces) or you (think homemade cakes and chutney, in tea and coffee, over cereal and oats). • fruit juice and fruit juice concentrates. Importantly, it does NOT include sugars naturally present in milk (lactose), whole fruit (fructose, glucose) and vegetables (fructose, sucrose) as these are considered safe and okay to consume in any amount. And for the purposes of Clean Eating, I agree. Introducing a ‘One treat a day’ policy. Give up the Soda. These days an average under 18 year old is getting 25% of their sugar intake from sugar drinks (including fruit juice), which by the way, could be reduced instantly by just drinking water. Giving them a list of healthy snack alternatives. Show then how much sugar is in the food they want to eat. It’s easy to monitor the amount of sugar you eat when you are physically spooning it onto your food. You can count. one teaspoon, two teaspoons. But what if you can’t see it? Processed foods are laden with hidden sugars. Soda, fruit juices, candies, and ice cream are the obvious culprits, but it’s also in the ‘healthy options’ including breads, meats, and it’s your favorite condiments like BBQ sauce and ketchup. Even some infants formula can contain as much sugar as a can of soda. Today, an average American consumes about 37 teaspoons of sugar per day and this figure goes up not down every year. Remember the recommended amount of 6 teaspoons? Hmmm. In the 1700s the average person only consumed four pounds of sugar per year1 – and that’s most likely from healthful natural sources like fruits, and not from the processed foods you see in supermarket shelves today. Now though, the average American consumes roughly 47 pounds of cane sugar and 35 pounds of high-fructose corn syrup every year. And they don’t even know it! See the Washington Post results for the study for free here. Carey, you say, there is no way my family is eating 37 teaspoons of sugar a day! No way. Okay. Think about it just for a moment. Let’s consider where sugar is hiding. We will take an innocent looking blueberry as our example. 1/2 a cup of fresh blueberries (1 teaspoon of sugar) vs 1/4 cup dried blueberries (5 1/2 teaspoons of sugar). Same thing? No. Now that you know this, which one would you want your child to snack on? Think about popping those dried blueberries into a batch of muffins with a little bit more added sugar. And so the problem starts …because if we went according to the World Health guidelines, they aren’t even counting these sugars (because dried fruit is technically whole food). This is just Nature sneakily hiding sugar. It gets worse when you start to look at how much of the stuff packaged food manufacturers are sneakily cramming into our food. What’s the big deal about sugar? Sugar is a problem, but it’s not THE problem. The crazy amount of it that we are eating is THE problem. We don’t need to completely eliminate it from our diet. But we do need to reduce it. We are eating far too much. But first we need to know where it’s hiding. Luckily, we can dramatically cut the amount of sugar our family eats by simply eating real foods and cutting out the processed crap. Dr. Robert Lustig, a professor of Clinical Pediatrics in the Division of Endocrinology in the University of California is a pioneer in decoding sugar metabolism. Lustig says that your body can safely metabolize at least six teaspoons of added sugar per day. But since the average person is consuming over three times that amount, the majority of the excess sugar becomes metabolized into body fat. This, in turn, is leading to the flood of debilitating chronic metabolic diseases we are seeing everywhere. Research from some of America’s most respected institutions now confirms that sugar is a primary dietary factor that drives obesity and chronic disease development, such as cancer, Alzheimer’s and Diabetes. They say sugar is Addictive. We can’t stop eating it. Nonsense. Most of the time, we don’t even know we’re eating it. I makes me mad when parents give in to their children’s every whim. I see them in the supermarkets, buying a massive bar of chocolate for their three year old. Of course kids want that chocolate bar. It tastes good. Yes it gives us a happy buzz. But is it an addiction. Hell no. I’m not saying never, ever get them a chocolate bar, but everything within moderation. Learning what moderation is, though, this is where many of us are failing. We’ve been sold the idea that a chocolate bar is a ‘serving size’ along with its sneaky 6 teaspoons (or more) or sugar. Would you let your child sit there and eat 6 teaspoons of sugar – every day? I don’t think so. Choose Real food meals and snacks. Avoid refined, processed foods such as white bread and cereals. Eat More vegetables and fruit. Drink Water instead of soda and fruit juices. Be aware of how much sugar is in the food you are eating. Don’t keep unhealthy foods at home. Make your home a Real food Zone. Make your own biscuits and baking. At least you know how much sugar is going in your muffins. – Add salt – this enhances natural sweetness. – Use fruit as a sweetener. How much Sugar is in that? So what can we take away from all this? We can’t make excuses. 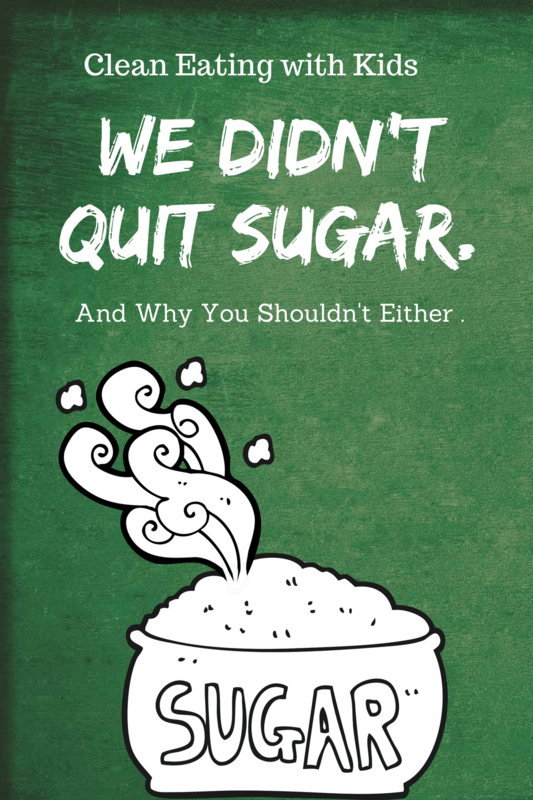 We eat too much Sugar and it’s bad for us. Most of the Sugar we eat is hidden. We don’t even know its there. We cannot continue to feed our family processed, packaged foods anymore. We cannot trust that what’s going in them is good for us. Go ahead and eat sugar BUT know how much you are eating. As Moms, we need to take back the control and be accountable for the amount of sugar we are feeding our family. We need to teach our children all of the above.